1) Observations of similarities in timing and frequency of event deposits from lake sediments and the marine record of Cascadia earthquakes (Morey et al., 2013 and 2011 conference poster). 3) Development of a southern Cascadia earthquake chronology to address the whether or not southern Cascadia experiences more frequent earthquakes (in prep). 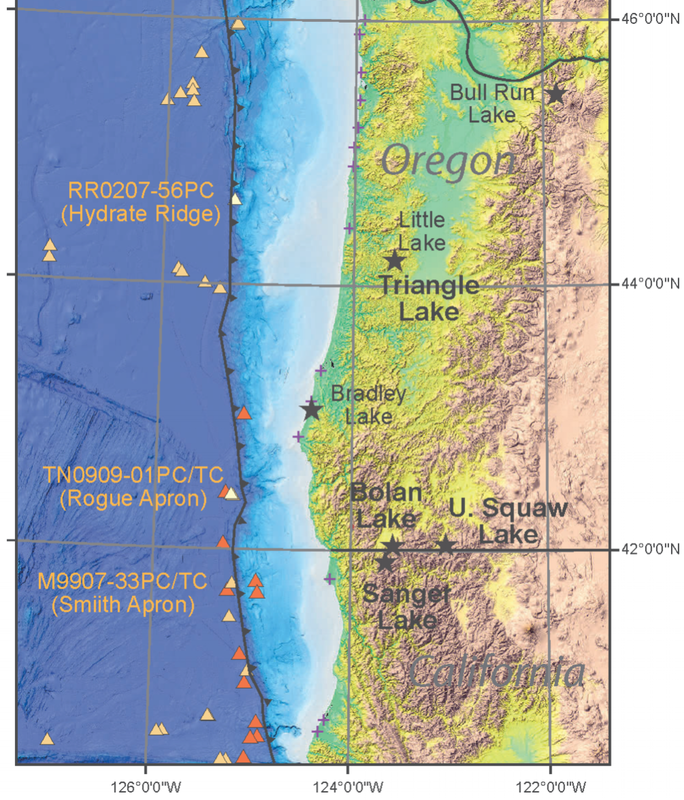 Part 1: The timing and frequency of disturbances recorded in the sedimentary records from southern Oregon and northern California lakes suggest a link to Cascadia earthquakes. Morey et al., 2013, describe disturbance event sequences from southern Cascadia lakes, and compare event timing and frequency to the marine record of Cascadia earthquakes. The locations of the sedimentary sequences used in this study are shown in Figure 1 (shown to the right). Three of the lakes, Bolan, Sanger and Upper Squaw Lakes, are located in the Klamath Mountains near the California/Oregon border. Fig 1. Lake and marine core locations used in this study. Modified from Fig. 1 of Morey et al., 2013. NOTE: 4/18/2019 - I noticed inconsistencies in the references. These will be fixed over the next day or two.